It had been quite some time since I had traveled to San Pedro, but when Tracy and I finally did, we certainly made a day of it. 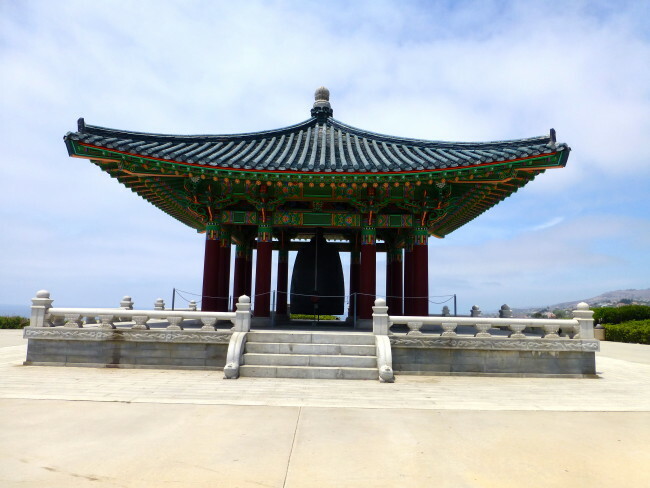 We visited the USS Iowa, Point Fermin Lighthouse, Fort MacArthur and the Korean Bell Of Friendship. Let’s start with the latter, and I’ll get to the others in subsequent reports. We drove near the corner of Gaffney and 37th Streets and, after parking in the lot, we started walking toward a large, colorful stone pagoda-like pavilion that holds the bell. 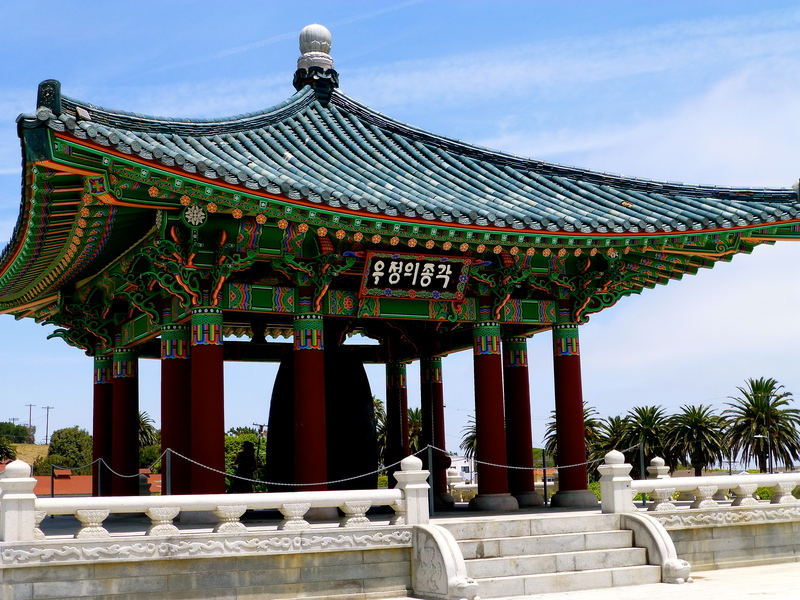 The pavilion is in what is called the Korean-American Peace Park, which actually is located inside a space inside Angel’s Gate Park. 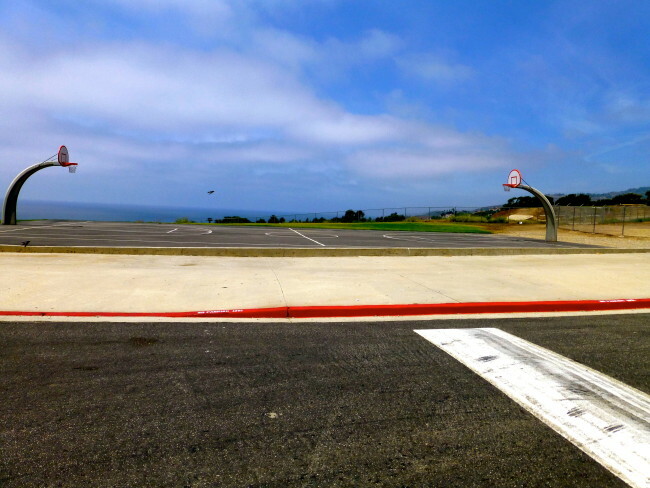 It also occupies part of the former Upper Reservation of Fort MacArthur. It sounds more confusing than it is. 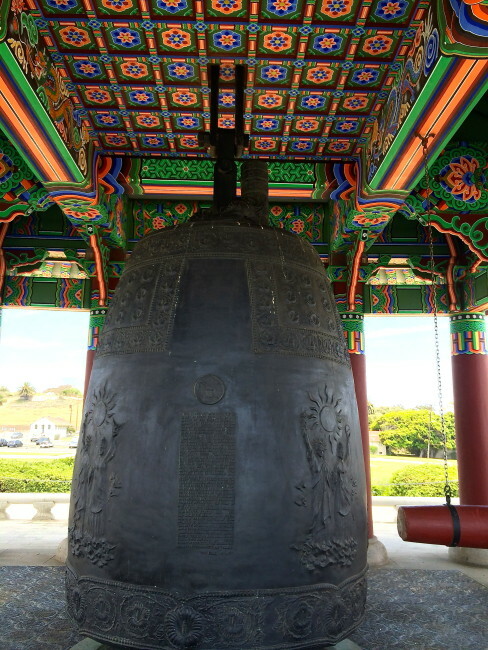 The Korean Bell of Friendship (aka the Korean Friendship Bell) was presented to the United States people by the Republic of Korea to celebrate the 1976 bicentennial. 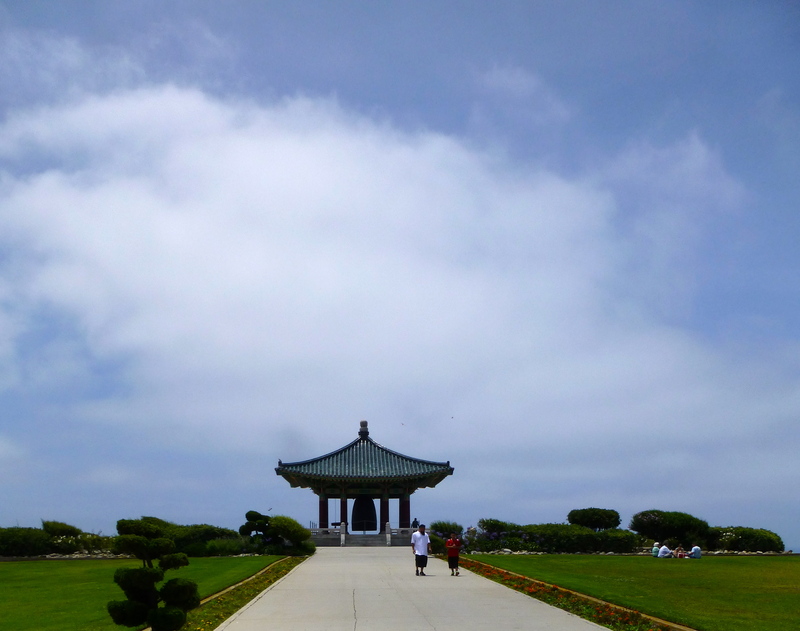 As the name implies, it was given to the U.S. as a symbol of the friendship between the two countries. The dedication took place on on October 3, 1976. 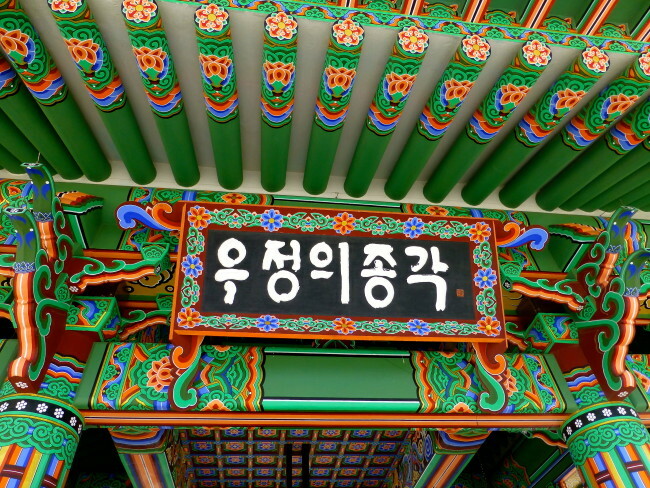 The effort for this project was spearheaded by a respected Korean actor, Philip Ahn. 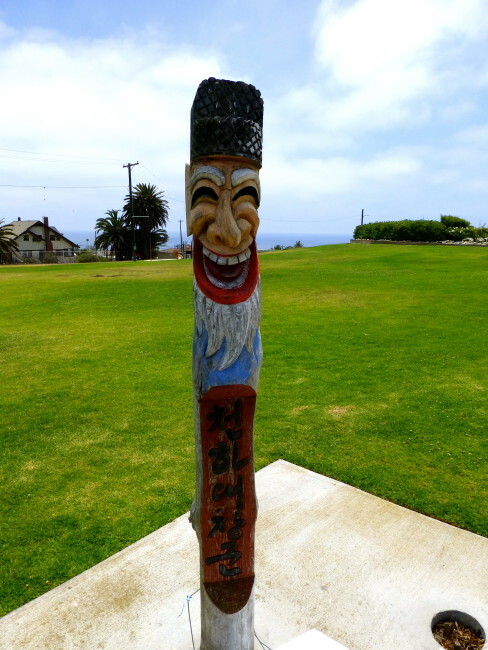 As we walked toward the bell, we passed by a couple of Funny Guys that had been carved out of wood. I wasn’t sure, but he might have been laughing at me because my parking abilities were not that good on this morning. 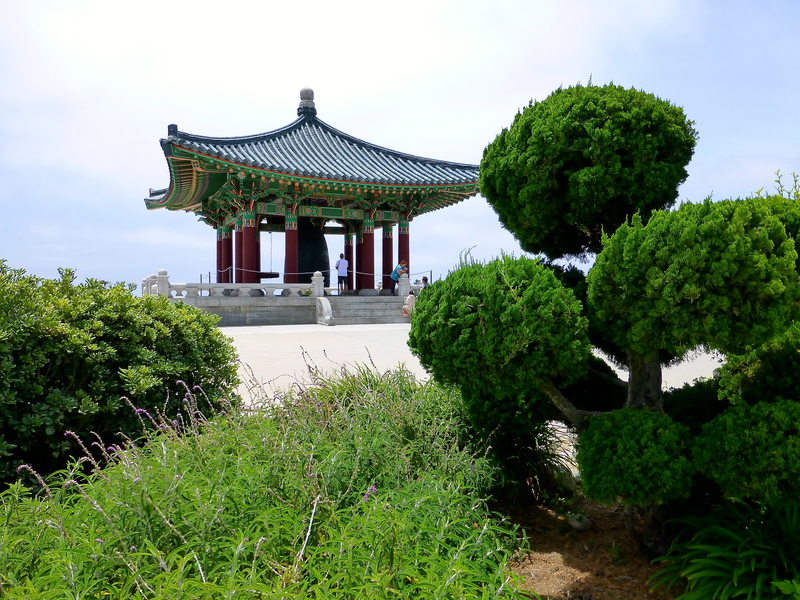 I don’t know if they are something out of Korean folklore, but I couldn’t find any information on them. When Tracy and I got closer, we realized this was definitely one, big bell. 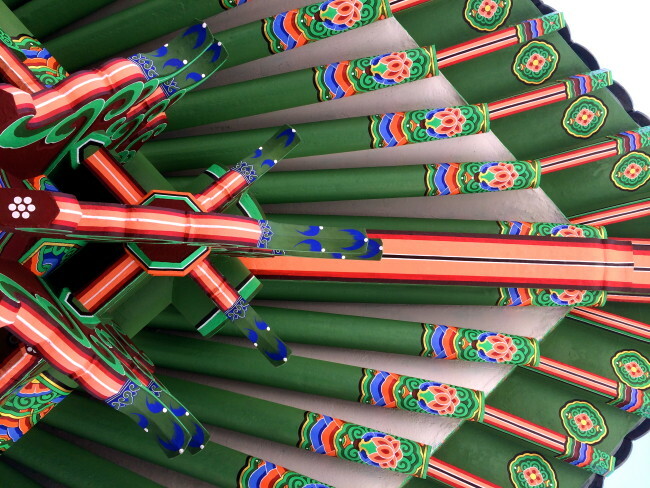 The Korean Friendship Bell is patterned after the Divine Bell of King Seongdeok the Great Silla. 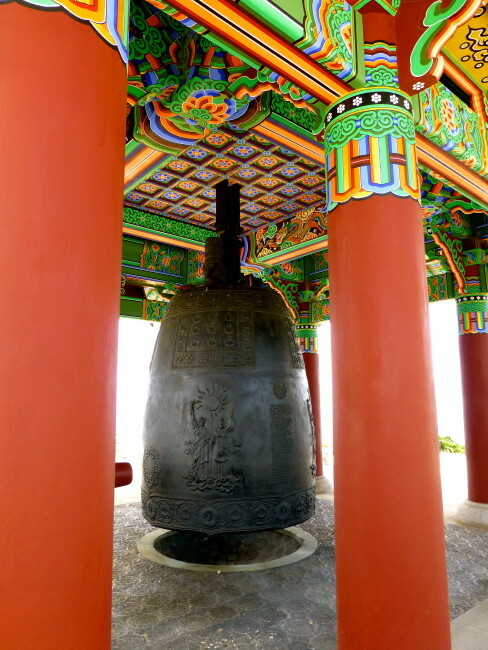 The bell (also known as the Emille Bell due to a legend about its casting) was cast in 771 for the Bongdeok Temple. The Emille Bell is now located at the National Museum of Gyeonguju and is the largest bell ever cast in Korean history. According to legend (and wikipedia), “….the first bell that was cast produced no sound when it was struck. The bell was recast many times but with no success. The king that had wanted the bell cast died after a while and his young son took over with the help of the queen. The son carried out what his father had started but still he didn’t have any success. 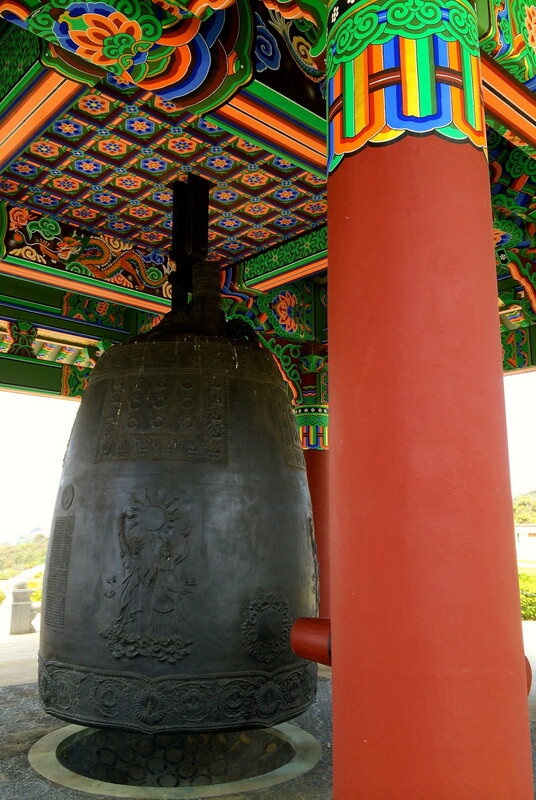 Later, a monk dreamed that if a child was cast into the metal, the bell would ring. The monk then took a child from the village and had her cast into the metal. When the bell was complete, the bell made the most beautiful sound when struck.” Of course, not a great story for the kid. The Korean Friendship Bell is also one of the biggest bells in the world. 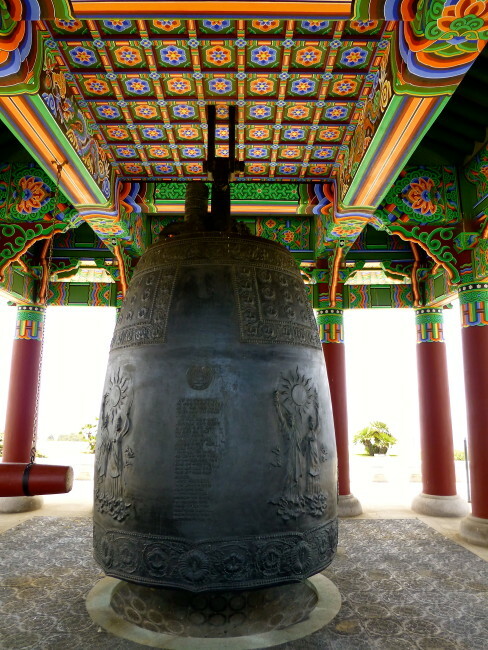 Like the Emille Bell, it has a diameter of 7½ feet, an average thickness of 8 inches, and a height of 12 feet. The beautiful pavilion is called the Belfry of Friendship. It took Korean craftsmen early ten months to complete, and is quite an accomplishment while being quite beautiful. 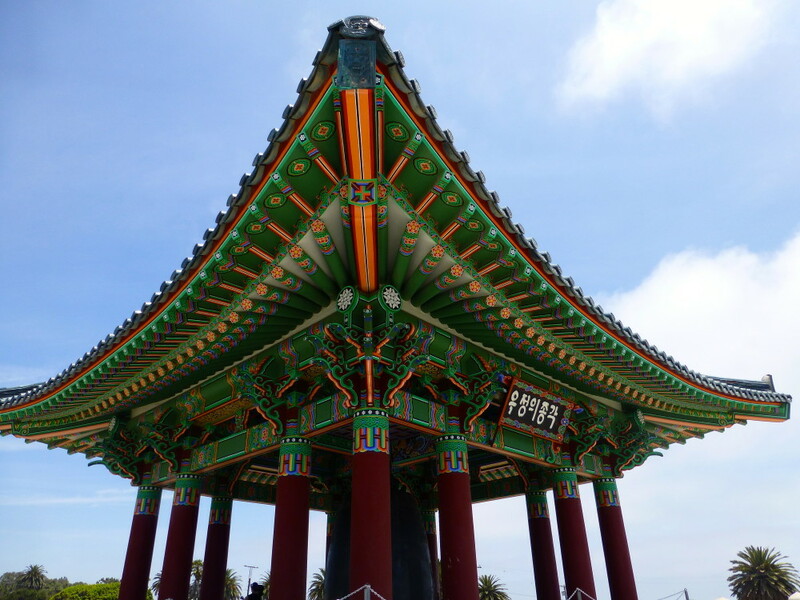 The gorgeous ceiling of the pavilion is supported by 12 columns that represent the Korean Zodiac. 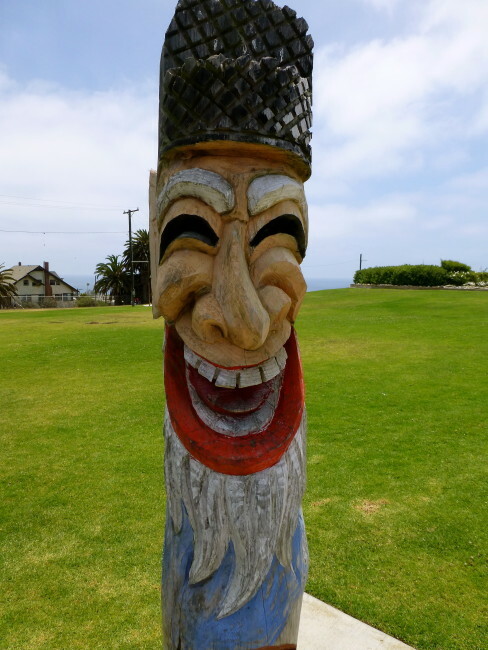 Each of the columns is “guarded” by a carved animal. 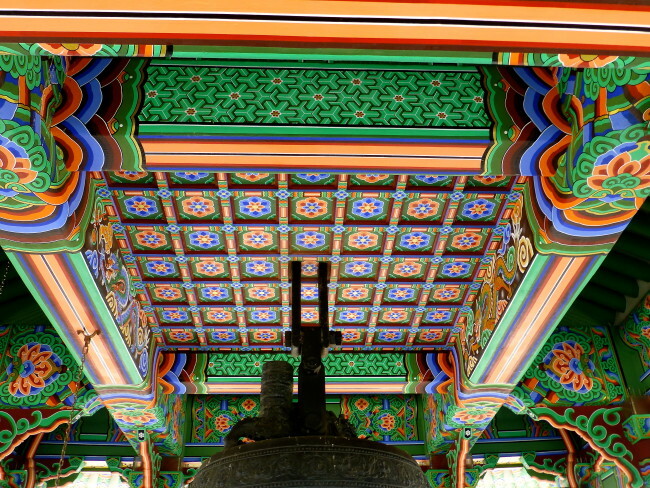 The ceiling/roof is beautiful from all angles. And there were lots of angles from which to look at it. The views out to sea were pretty spectacular, too. As we walked back to the car, I looked out to the ocean and realized I should bring a basketball next time. 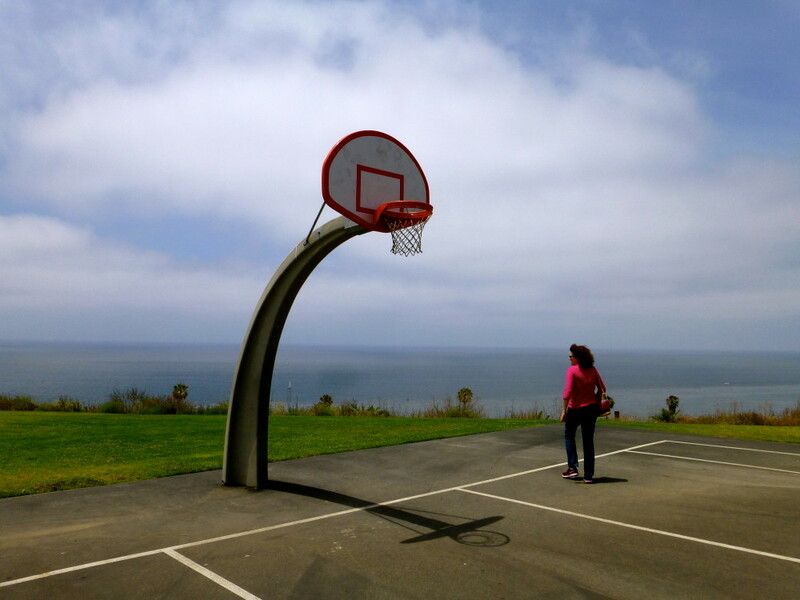 The nearby court has one of the nicest locations in Southern California to shoot hoops. Many in the South Korean community look at the bell as its country’s Statue Of Liberty showing the strong ties that exist between our two nations. The bell had fallen into disrepair, and was restored in 2013. Make it a point to stop by when you’re in the area.